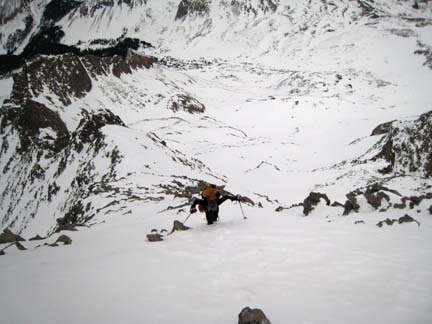 Sometime back in October or November 2006 Cynthia had sent me an e-mail with her proposed winter peak climbing schedule. For all of the climbs but one I was either busy or not exactly excited about it. 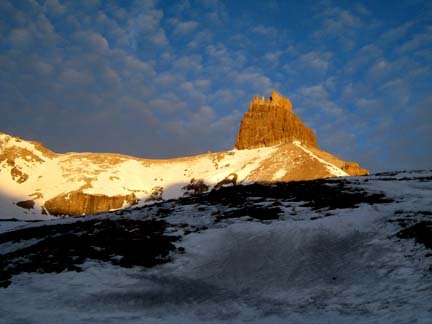 But one of her suggestions stuck out and intrigued me--Gladstone Peak, a high 13er in the San Juan Peaks. I had been next two it on three previous visits to the area to climb neighboring 14ers but had never had the time or opportunity to climb it. Without giving thought to logistics or route, I committed to the date--the weekend of February 9th. We'd figure out the details later. Later came faster than expected and we still hadn't decided how to tackle the peak. Struggle with a long, likely crappy and illegal approach through Silver Pick Basin, check out the Sunshine Mesa trailhead or figure something else out. 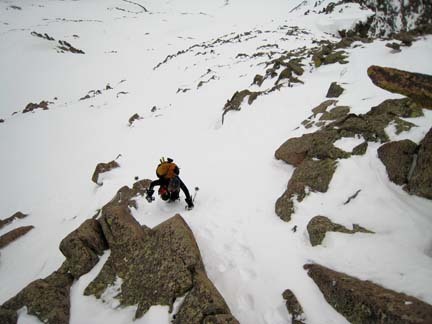 And then as luck would have it, Ken Nolan posted a trip report on 14erworld.com from his successful climb of Gladstone's east face in early January 2007! His route looked and sounded great and very doable. We planned to follow in his footsteps even if new snow and wind had literally obliterated the tracks. Because we hoped to climb the neighboring 14er, Wilson Peak, we'd setup a high camp just on the north side of the Cross Mountain-Lizardhead saddle. We awoke at 5:10am in our hotel room at the Rico Hotel. We had driven from New Mexico on Thursday night to arrive at the quaint hotel with "spartan" rooms. It was good enough for 5.5 hours of sleep. A short drive up the road got us to the Cross Mountain Trailhead by 6:30am. The trailhead area was plowed enough for 10 vehicles to park and was dry. By 7:00am we started off in warm conditions and had a nicely packed skin/snowshoe trail to follow through the trees all the way to the Cross-Lizardhead saddle. Our packs were heavy with comfort items but we figured it was such a short hike we might as well camp in relative style. Likely I frustrated Cynthia as I chose to use my splitboard snowboard for this trip rather than snowshoes and made quick time as she was forced to plod in snowshoes. But she didn't show any signs of being heavily slowed and kept a great pace all the way to our camp. We chose to descend north off of the saddle for about 100 feet to a nice snow/rock outcropping in a shallow gully for our camp. Quickly we shoveled out a nice platform and setup camp by 11:00am. I even had a short bit of time to cut some snow blocks to give camp that nicely appointed feeling. We'd be there two nights, might as well make it nice! Lodging for two for two nights with a view. No hot tub though. After camp was assembled we reconnoitered the planned route. All the obvious landmarks from Ken's report were visible and the line looked obvious. Hopefully we'd find nice consolidated snow over yonder. As Cynthia descended from camp down and across the upper basin towards Gladstone I assembled my snowboard and enjoyed a few hundred feet of turns into the basin. The snowpack was as I was expecting given the recent windy and warm conditions in the San Juans. It was nearly bullet proof and well consolidated. We were very encouraged by the stability of the snow. To be sure, though, we stuck to rocky ribs where we could as we climbed towards the prominent rock outcropping in the center of Gladstone's east face just below the major cliff band. 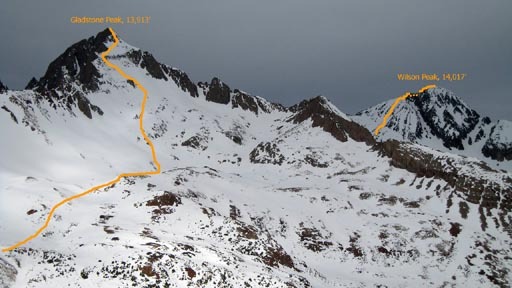 Photo showing our routes for both peaks for the weekend. 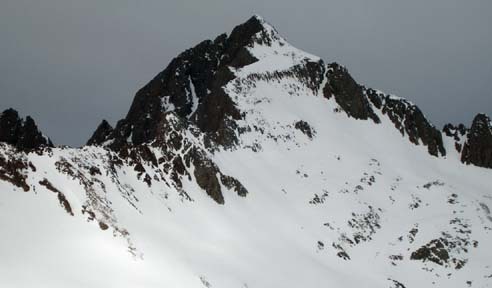 The lower portion of the route on Wilson Peak is obscured here by Gladstone's east ridge. 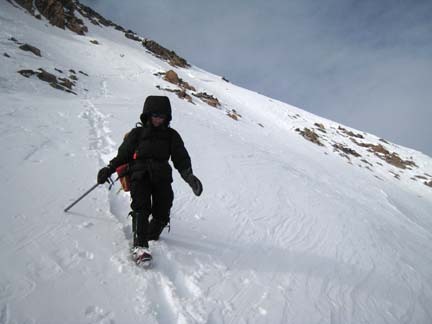 As we approached the 12,500' level the terrain became steep enough and slick enough that the splitboard skins and snowshoes were no longer effective. We cached the board and shoes on a rock and donned the crampons. From there the snow was perfect styrofoam just ripe for kicking great steps at times but then would turn to a crusty surface with a few inches of sugary snow just below in other spots closer to the rock bands. We did our best to find the good snow and stick to it. Just below the major rock outcropping we spaced out and took turns ascending the steeper headwall to distribute the weight on the snowpack for safety's sake. Ah, the view! Looking northeast towards the Telluride valley. 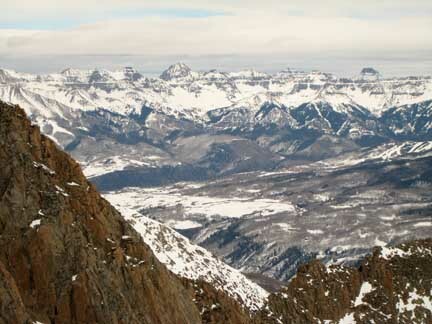 Mount Sneffels can be clearly seen. Once above the rock outcropping we had a great view of the cliff band and headed towards a farily obvious weakness in the left side. The climbing through this section was borderline 4th class but with the decent snow, it went with only a couple of grunt moves. We used the exposed rock for hand holds a couple of times as we climbed through it. Cynthia climbing through the cliff band. Once above the cliff band we had a foreshortened view of the small summit face and it looked so close. But my altimeter showed we still have at least a few hundred feet remaining. We gained the southeast ridge proper and wow, what a view! A dramatic drop to the south looking into the bowl on Mount Wilson's east face kept us well away from the corniced ridge as we kicked steps upwards. We even found a short section of Ken's previous tracks from a month ago along the ridge here. To gain the east ridge proper we climbed up a steep, shallow snow gully. On the east ridge proper only ~100 vertical feet from the summit. At 2:30pm we arrived at the summit! Conditions were amazing for February in the San Juans and I was in awe that we had actually reached the summit of this fine peak. The temperature was in the mid-20s and the wind was quite calm. In fact, I was wearing only a ball cap and sunglasses on my head and only a long-sleeved polypro shirt on my upper body and was very comfortable in that. The clouds had lifted on the surrounding peaks revealing a great view in all directions. The north ridge of Gladstone stretching towards Wilson Peak was quite dramatic. This also gave us a great opportunity to view the upper slopes of Wilson Peak's south face to plan our route for tomorrow! 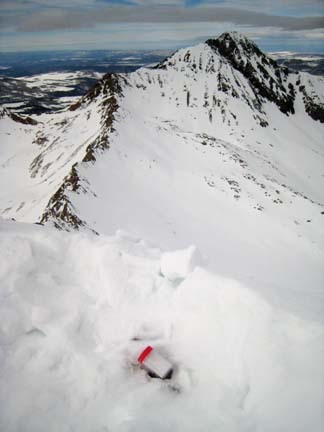 I got my shovel out and started digging for the summit register. I wasn't sure I'd find it but low and behold in only a couple of minutes I saw the red lid of the plastic peanut butter jar register that Ken had placed in September 2006! Looking at the north ridge of Gladstone connecting to Wilson Peak. With the exception of two other parties' entries in September, Ken's entry from January was the only other entry on the register. We felt quite lucky to be on the summit of Gladstone in February no doubt. After the normal summit photos and about 20 minutes of summit time, it was time to descend. 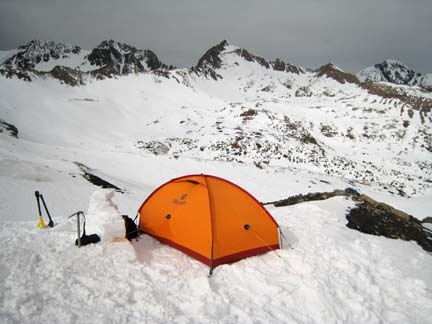 While I was pleased with the stability of snow on the ascent, I couldn't really relax until we reached the tent. Off we went plunge-stepping our previous tracks. Cynthia descending the upper slope just above the cliff band. As we descended, the weather improved and blue sky was appearing all over the place. The views continued to improve for the remainder of the afternoon and evening. The descent to 12,500' was uneventful save one of Cynthia's crampons popping off just 100 feet above where we had cached our snowshoes/snowboard so that wasn't much of a problem. I was excited to reach the snowboard and strap in for 1000 vertical feet of riding down and across the upper basin. I quickly cruised across the hard snow and while the turns weren't the highest of quality, it certainly was an efficient and fun return trip. And, nicely, I was able to see Cynthia from camp so I could monitor her progress as it was, after all, avalanche terrain. I spent the extra time melting snow, heating water and improving the snow wall around the tent to include a snow bench. As Cynthia reached the camp the clouds and sunset were making for a beautiful scene. It was damn hard to beat this outing! Evening light on Lizardhead seen from our high camp. Written by Jason Halladay on 12 Feburary 2007 for TheMountainInstitute.com.